I still can’t get over how great these personalized stamps are. Their personalized tshirts are also very cool. I ordered some for Fiona’s wee ones who love Ariel from disney but fight over all having her. So tshirts with Ariel and their names on them. Hopefully will fit them. I fear that her kids will be as tall as me and Jan when we see them again in March for the wedding. Anyway back to the matter in hand. So at the wonderful Gilroy Garlic festival - Garlic capital of the world seemingly… I wonder how the french feel about that one? We went as we’d never been and I heard a rumor that there was garlic everything including garlic wine. Being the natural hunters of wine that we are we found the blessed wine tent. and I mean blessed. It was 101 out at least and their tent was large, shady, had misting water keeping us cool and 10 wine vendors to do wine tasting. We were tempted to stay there all afternoon. Jan found the garlic wine. Now imagine garlic in pure liquid. Now imagine drinking it. Thats pretty much the taste. I love Garlic and never thought I’d find a garlic food that I didnt like. Now I have . We have tasted it for you so no need for you to even go there. If anyone ever asks you have you tasted it you can claim you know someone who did and it was as revolting as it sounds. I will give them credit for making it and also imagine a nice chicken or duck would be fantastic soaked in it. (I make a great tri-tip in jack daniels !) For anything else I cant imagine how anyone would drink it. The festival was great fun though and we met some more zazzle people at the fair. We had a lovely wine tasting wee event at zazzle friday and I got to meet the rest of Jan’s co-workers. What a great bunch of people and we enjoyed the wine and cheese as well ! 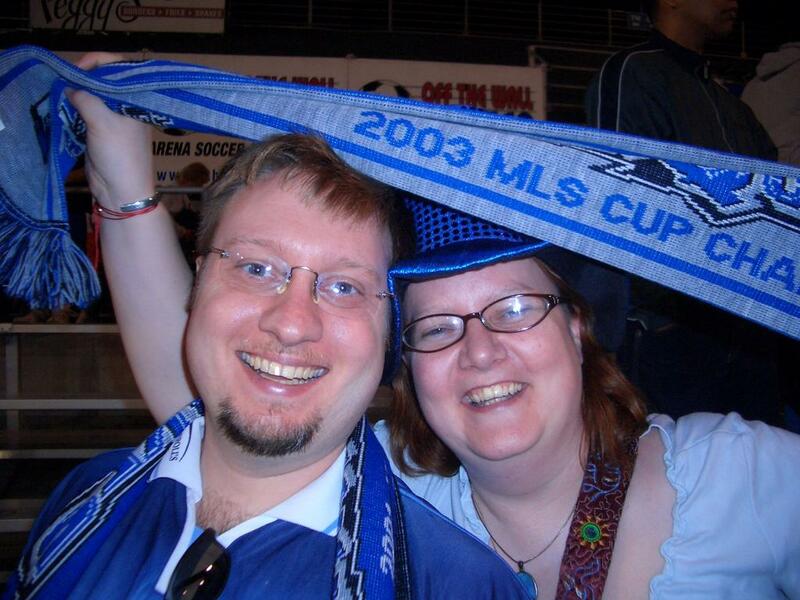 A picture of myself and Jan at an earthquakes San Jose game..